The Gai Waterhouse and Adrian Bott-trained Chocolatier shone brightly on a rainy afternoon to claim Sunday's $40,000 feature Bathurst Cup (1800m). Chocolatier ($1.90 favourite) lived up to his name by producing a sweet treat for his large ownership group on the Tyers Park turf, flying away from the pack under the guidance of James Innes Jnr to win by three lengths ahead of Chief Kidder ($10, Grant Buckley). Spokesperson for the ownership group, Noel Patterson, said it was a great feeling to see the Redoute's Choice x La Praline gelding living up to his potential. 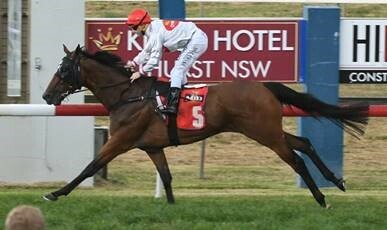 "Chocolatier is my second horse through Dynamic Syndications. He's been a problem over a long period of time. "He didn't start his career until just before he was a four-year-old but he's a really gutsy horse and we all love him very, very much. Innes set out determined to make the race happen on his terms and lead the field during the first trip past the winning post. He comfortably held the top spot from barrier two while Chief Kidder raced half a length away on his outside. At the 800m Dynamic Dynasty raced three wide to draw alongside Chocolatier. The pair put a length on Chief Kidder while Kingsbridge and Charlie Royale were a further two lengths away as the turn for home approached. At the 200m Chocolatier and Chief Kidder looked the likely winners as a host a wider runners failed to make an impact. Chocolatier was Innes Jnr's only ride of the day at Bathurst, due to an earlier scratching, and he made it one to remember. Bathurst's only home-trained hope Sovereignaire was outclassed and finished at the tail of the field in 14th position.